A concretion formed in any part of the body, most commonly in the passages of the biliary and urinary tracts; usually composed of salts of inorganic or organic acids, or of other material such as cholesterol. dental calculus calcium phosphate and carbonate, with organic matter, deposited on tooth surfaces. lung calculus one formed in the bronchi by accretion about an inorganic nucleus, or from calcified portions of lung tissue or adjacent lymph nodes. oxalate calculus a urinary calculus made of calcium oxalate; some have tiny sharp spines and others are smooth. renal calculus one in the kidney. struvite calculus a urinary calculus of crystals of struvite (magnesium ammonium phosphate). supragingival calculus that covering the coronal surface of the tooth to the crest of the gingival margin. urinary calculus one in any part of the urinary tract. uterine calculus uterolith; a concretion in the uterus. vesical calculus one in the urinary bladder. 1. Medicine An abnormal concretion in the body, usually formed of mineral salts and found in the gallbladder, kidney, or urinary bladder, for example. 1 also called stone. an abnormal stone formed in body tissues by an accumulation of mineral salts. Calculi are usually found in biliary and urinary tracts. Kinds of calculi include biliary calculus and renal calculus. 2 (in dentistry) also called tartar. A deposit of mineralized bacterial plaque biofilm, calcium phosphate, calcium carbonate, and organic matter that accumulates on the teeth or a dental prosthesis. Calculus that forms coronal to the gingival crest, called supragingival calculus, is chalky and cream-colored but may be stained by drinks such as tea or coffee, tobacco and food. Calculus that forms in the gingival pocket, or the periodontal pocket, called serumal calculus, subgingival calculus, or veneer, is usually denser and darker than supragingival calculus; slight deposits may be invisible until dried with air lending a chalky appearance. It harbors bacteria, thus contributing to periodontal disease. Indurated, yellow-brown/black deposits on teeth formed by bacteria in dental plaques from mineralised calcium salts in saliva and subgingival transudates. A stone in the urinary tract. An abnormal, often calcium-rich mass found in various tissues, seen by light microscopy. Plural, calculi Dentistry Tartar Indurated, yellow–brown/black deposits on teeth formed by bacteria in dental plaques from mineralized calcium salts in saliva and subgingival transudates Kidneys A stone in the urinary tract. See Mulberry calculus, Staghorn calculus. A stone of any kind formed abnormally in the body, mainly in the urinary system and the gall bladder. Calculi form in fluids in which high concentrations of chemical substances are dissolved. Their formation is encouraged by infection. Any type of hard concretion (stone) in the body, but usually found in the gallbladder, pancreas and kidneys. They are formed by the accumulation of excess mineral salts and other organic material such as blood or mucous. Calculi (pl.) can cause problems by lodging in and obstructing the proper flow of fluids, such as bile to the intestines or urine to the bladder. the use of small changes to calculate derivatives of equations. Includes differentiation (calculation of gradients) and integration (calculation of areas). Invented in the 17th century by Newton and Leibnitz independently. 2. Concretion formed in any part of the body, most commonly in passages of biliary and urinary tracts; usually composed of salts of inorganic or organic acids, or of other material such as cholesterol. n a hard deposit on the exposed surfaces of the teeth and any oral prosthesis within the oral cavity. It is composed of calcium phosphate, calcium carbonate, magnesium phosphate, and other elements within an organic matrix composed of plaque, desquamated epithelium, mucin, microorganisms, and other debris. 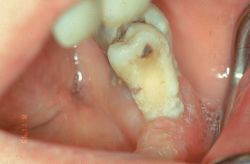 Factor in the initiation and continuation of periodontal disease. The colloquial term is tartar. n the use of compressed air to dry the periodontium and visualize minimal amounts of calculus, which are otherwise difficult to see, especially subgingivally. n a written accounting of the number and distribution of calculus deposits on tooth surfaces that becomes part of the patient's permanent chart and is used to monitor progress and plan treatment. Q. Why do i get kidney stones? I am 38 and have had three stones pass so far. Is it the coffee, the meat, the stress, or the damned DNA?! My uncle is in his 50s and has passed over 30 stones! A. Kidney stones are very common and even without the genetic or familial background people tend to get them. Of course, the more family predisposition you have, the higher are your chances of developing them, which is probably why you did. Also, a diet rich with dairy and calcium can cause your body to store excess calcium, that tends to calcify and create stones. Not drinking enough fluid is also one of the reasons. Q. how do i cure tonsil stones (tonsiloth)? A. There are very little literature about this subject, but I heard about treatment in which the crypts (deep and narrow grooves on the tongue in which the stones form) are burned with laser. As far as I know these stones don't cause damage by themselves so it's not such a common treatment.